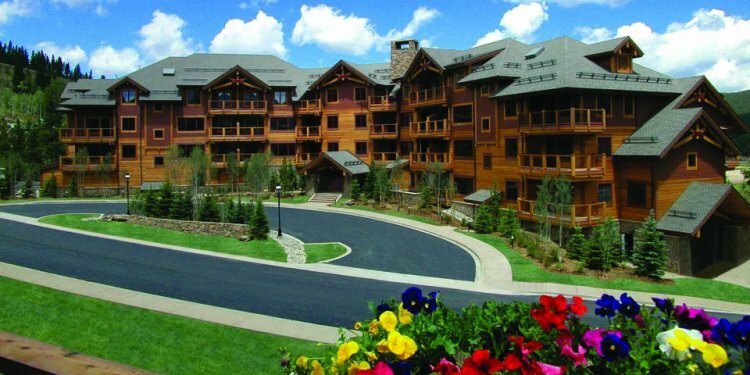 Located in the heart of the Breckenridge Ski Resort in beautiful Colorado, Mountain Thunder Lodge features cosmopolitan luxury, in a rustic mountain setting. Whether you're planning a Colorado family ski vacation or a weekend group ski trip with friends, Mountain Thunder Lodge is the complete Colorado ski destination. Mountain Thunder Lodge is beautifully decorated with an elegant but rustic feel. The main floor grand lobby is a sitting area that features log accents, slate floors, plush furniture, and a fireplace. These rustic motifs are featured in each of Lodge's rooms and townhomes. Numerous outdoor hot tubs are located throughout the property and the outdoor pool is one of the most scenic and relaxing in all of Breckenridge. Â Enjoy countless comforting amenities like outdoor grills, two fitness rooms, laundry facilities, private ski storage and more. Just two blocks to scenic Main Street, easily access by foot unlimited shopping, restaurants, galleries, museums, ski/board/bike rentals, and many other unique shops. The lodge is also a short walk to the BreckConnect Gondola and offers guest's convenient ski-in access via the Skyway Skiway.Â The Gondola takes you to Peaks 7 and 8, where you can catch the other lifts, sign up for lessons, enjoy the half pipe and terrain park and access all of Breck. When you are ready for the hot tub, ski back to Mountain Thunder Lodge and relax in one of five hot tubs or the outdoor heated pool. Or, simply take a load off in yourÂ luxury condo or townhome. Mountain Thunder Lodge offers a variety of lodging choices including studio, one-, two-, and three-bedroom condominiums and two- and three-bedroom town homes. Mountain Thunder Lodge was the recipient of the 2010 OrbitzÂ Best In StayÂ award and the 2007, 2009, 2010 & 2011Â Expedia Insiders SelectÂ awards.